Beautiful map depicting the Holy Roman Empire's Circle of Austria. Cercle D'Autriche : divise en toutes ses Provinces, tant Civiles qu'Ecclesiastiques. This is a lovely 1786 map by the French Cartographer Louis Brion de la Tour detailing the counties and duchies of Austria. It covers from Lake Constance eastward to Hungary and south as far as the Adriatic Sea. The Circle of Austria was, as shown here, bordered by Swabia, Bavaria, Bohemia and Moravia to the North, to Switzerland on the west, the Venetian States, and the Adriatic, to the south, and Croatia and Hungary to the east. The map includes Vienna, the traditional seat of the House of Habsburg and, usually, the Holy Roman Emperor. The 'circle' in the map's title refers to an 'imperial circle,' one of the administrative units created primarily for tax and defense purposes by the Holy Roman Empire. The Napoleonic Wars would, of course, dissolve the Holy Roman Empire and lead to the consolidation of Germany in 1871, with a separate Austria. A beautifully engraved title cartouche adorns the top left quadrant of the map. To the left and right of the map are paste downs of French text with remarks and description of the map. Surrounding the whole is an elaborate decorative border featuring floral arrangements, surveying tools, elaborate baroque scalloping, and a winged globe. This map was issued as plate no. 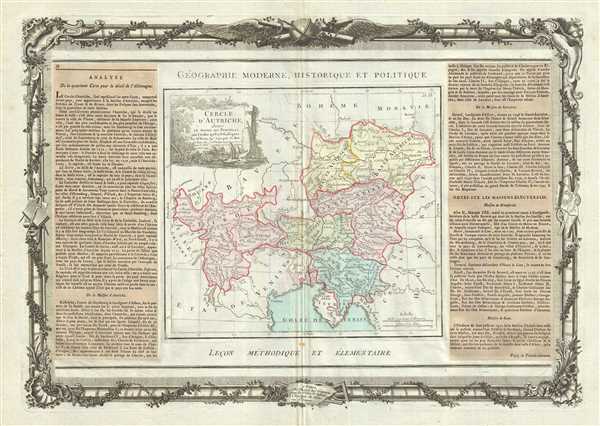 33 in the most deluxe edition of Desnos’ 1786 Atlas General Methodique et Elementaire, Pour l’Etude de la Geographie et de l’Histoire Moderne.